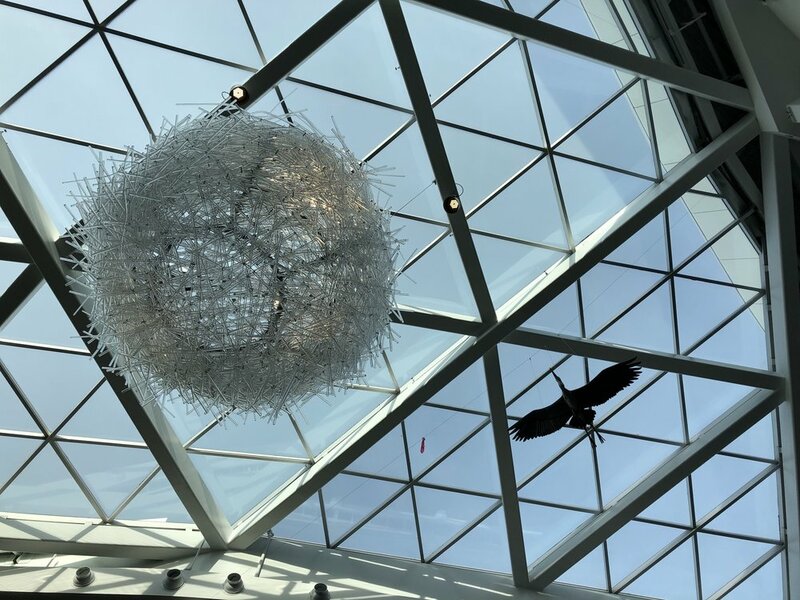 Last week we gathered with community members and DPS students to celebrate the dedication of Catherine Widgery's newest work of public art, Woven Light, as it was welcomed into the Denver Public Art Collection. 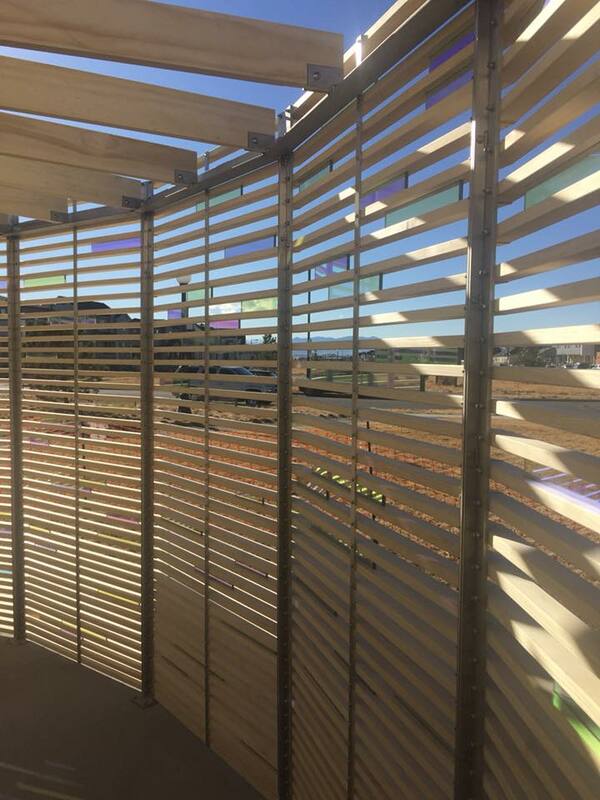 Located in Denver's Northfield Community at Uplands Park (5007 Willow Street), this interactive work of art encourages exploration of the structure and how it relates to it's surroundings, specifically the natural light. Catherine was on hand to talk about her vision for this work, answer questions and sign autographs for the students. Watch the video clip below to see what happens when 30 elementary school students descend on Woven Light. 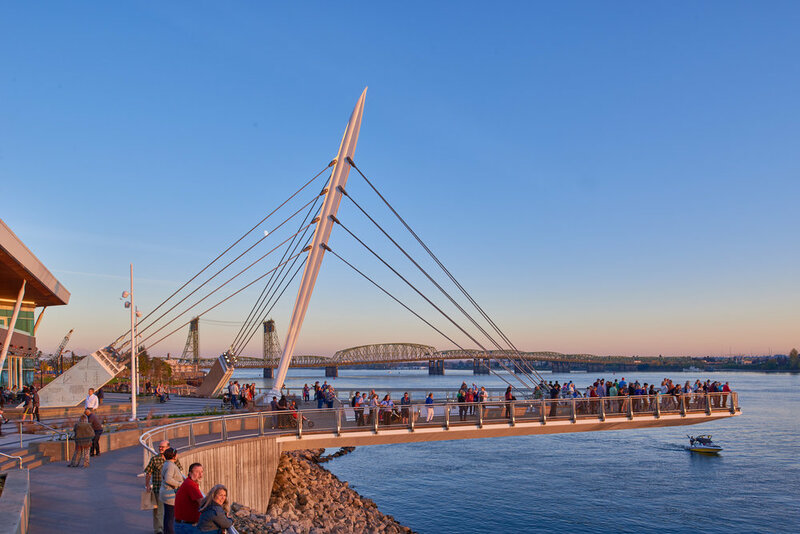 In the artist's words, "Woven Light is an outdoor room; you are inside and outside at the same time and the shadows, light and projected color make you more conscious of the sun and the breeze than if you were standing in the open." "When seen from the outside, the dichroic glass between the slats reflects the sky and surrounding trees. Inside is like being in a kaleidoscope of moving colored lights on the darkened interior as the sun shifts angle. We can look through the openings or through the glass that changes the color of the landscape like a lens. Endlessly changing patterns of crisscrossing shadows and reflected light within and on the ground dematerialize the structure and make a rich shadow on the ground extending the impact of the art beyond its physical boundaries." "Woven Light is a shady refuge from the intensity of the prairie light. The angle of the slats will always cast shadow somewhere in the structure no matter where the sun. Seating along the curved walls inside encourages people to stay and ponder the light and space. Woven Light is a structure through which we discover the beauty that surrounds us: the sky, mountains in the distance, sunlight and leaves on the nearby trees moving in the wind." Thank you to everyone who made it out in celebration of this stunning work of public art. We look forward to revisiting this work for years to come. If you are in the Denver area make sure to plan a visit. Installation for Catherine Widgery's 'Woven Light' wrapped up earlier this month. Thanks to the amazing team at JunoWorks and Cody Moore for all their hard work on this project. "Woven Light is an outdoor room; you are inside and outside at the same time and the shadows, light and projected color make you more conscious of the sun and the breeze than if you were standing in the open. When seen from the outside, the dichroic glass between the slats reflects the sky and surrounding trees. Inside is like being in a kaleidoscope of moving colored lights on the darkened interior as the sun shifts angle." If you are in the Denver area you can experience ‘Woven Light’ at the Northfield Uplands Park in Stapleton.